Ditto is a straightforward utility that enables you to extend your Windows clipboard as it lets you save multiple items you places there, and as a result access them later. The application runs in the system tray and from the related icon you can quickly access the copied content as all items you added on the clipboard are shown in a list and you can choose the one you need from there. The built-in search function lets you easily find copied content, which is particularly useful when the list has many/long items that are difficult to browse. Besides remembering files you add on the clipboard, the tool lets you save lists to files and re-load them later. Working with a large number of documents and web pages often involves the need to copy multiple chunks of content from one of them and paste it in one or multiple files, and operation that is not always as easy as might seem. Ditto is one of the applications that can help you perform this action in an intuitive and fast manner, as it has been designed to remember all of the items that you have placed in the clipboard, regardless of whether they are text, images, links, or entire files. 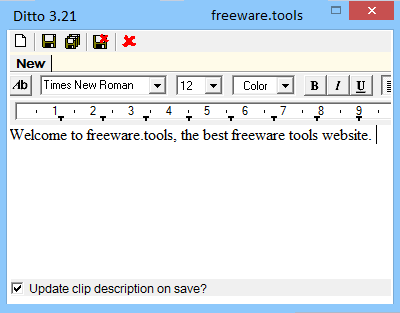 The program places an icon in the System Tray and allows you to access the copied content with a single mouse click. All items placed on the clipboard are displayed in a list, and you can select the one you need and paste it where needed. The tool includes a search function so that you could find a particular item effortlessly. The feature should prove very useful when the list items is long and difficult to browse. In addition to remembering the files placed on the clipboard, Ditto allows you to save lists to files and to load them whenever needed. Thus, you can continue your work and remain efficient even after restarting the computer or when moving to a new workstation. Ditto allows you to select a desired location for its database, as well as to compact or repair it when needed. Moreover, you can copy it to any other location, which makes it easy to migrate to a new machine. The application can be activated with the help of keyboard shortcuts. Moreover, it allows you to assign shortcuts to its various functions, for faster access and increased efficiency. You can limit the number of items that the program should remember, and you can also limit the descriptions of these items to a desired number of characters. All in all, Ditto is an easy-to-use, snappy clipboard extension that allows you to copy and paste more content in a more efficient manner. It supports text, images, files, and other types of content, can be used with the help of keyboard shortcuts, and allows you to manage its database in an efficient manner.